Note: this post originally appeared at Inkspot in August 2007. I’m reposting it here because it’s perhaps my one truly genius idea. Plus, me and some buddies were talking about it on Twitter today. I’ve dreamed of being a writer for most of my life. I wrote my first story, “The Night of the Bats,” in the fourth grade1. Followed that up with a screenplay for an episode of the Daniel Boone TV series. By junior high school I was actually submitting stories, and when an editor from Isaac Asimov’s Science Fiction magazine sent me a hand-written rejection, I was hooked. The dream had taken hold of me down in my belly and it wasn’t letting go. With the dream of writing came other dreams. Sub-dreams, perhaps. Meta dreams. In high school, I admit, I dreamed of a guest appearance on The Tonight Show, of a writing studio in Paris, of a spot on the New York Times bestseller list. Most of these meta dreams have faded over the years (well, maybe not the NYT one, entirely), but one dream has stuck with me. A dream that I hope to someday realize. It’s an old dream. Older than Paris, older than The Tonight Show. At least as old as the New York Times bestseller list. 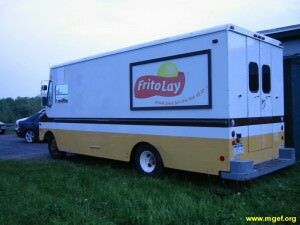 It’s a dream I call The Frito Truck. I buy one of those panel trucks that delivers tasty snacks to grocery stores. And I fix up the interior as a writing den. Inside the Frito truck! Take a moment with me to think about that. To savor it. There’ll be a desk and a couple of comfortable chairs (in case someone stops by). I’ll have bookcases for reference materials and other books I want to have on hand. Dark wood and soft carpeting. One wall is tricked out to lift up, exposing a bank of windows so I can have a view while I write. Meanwhile, on the exterior, it looks like a delivery truck, right down to the Frito-Lay logo painted on the sides. Thats a fine dream, I like it.